No less than the internal combustion engine, the transistor, or the silicon chip, barbed wire is a quintessentially modern invention, a product that has influenced the lives of millions of people across the globe since its invention in the late nineteenth century. 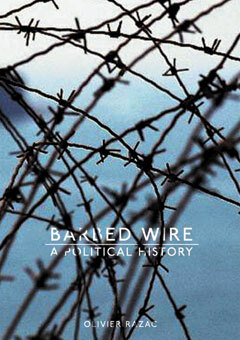 Now in paperback, Barbed Wire: A Political History demonstrates that the invention of barbed wire was a major breakthrough with far-reaching consequences. Cheap and mass-produced, barbed wire accomplished what no other product did before it, or has since done more effectively: the control of vast amounts of open space. Razac describes how barbed wire has been employed in the harnessing of nature, brutal mass warfare, political conquest and repression, and genocide. In a narrative that spans the history of the American frontier, the trenches of World War I, the Holocaust, and beyond, Barbed Wire: A Political History looks unflinchingly at a central and fascinating strand of modern life.